Pent Shed, Offers & Deals, Who has the Best Right Now? A pent shed may not be as tall or ostentatious as apex roofed sheds, but for many people that’s just one of their advantages as it means that they can be hidden securely behind a wall or fence. 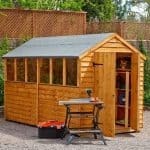 They can also be a very attractive and traditionally styled garden building, and whilst smaller models are perfect for storing garden tools, larger sheds can be used for holding motorcycles or to use as a home office in the garden. 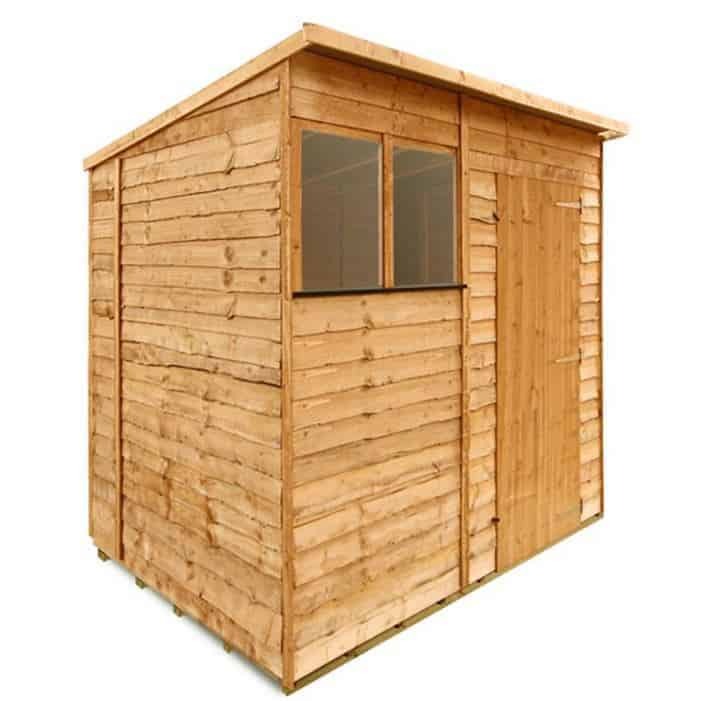 Whatever you want to use it for, there are a huge number of pent sheds to choose from. That’s why WhatShed have created this helpful guide to the top 20 pent sheds that can be bought online in the UK today. We’ve looked at pent sheds in all sizes, although we’ve discounted those pent roofed garden buildings designed primarily as log cabins or summer houses. 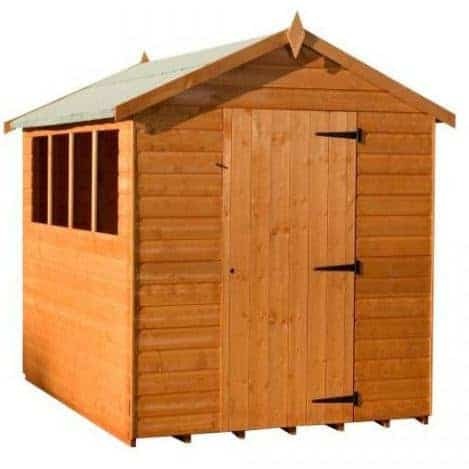 You’ll find models made of timber, metal and plastic, and we have included sheds to suit all budgets. The only unifying factor is high quality, and to sort them into a league table we’ve considered cost and value for money, durability, and aesthetic appeal. This way we were able to compile the very best pent sheds that can be purchased online in the UK right now, along with nineteen high quality runners up. With so many pent sheds available on the market, made from wood, metal, and plastic, selecting the best was always going to prove a difficult task. We say congratulations then to the Absco Storemaster 3PE. It’s generously proportioned for a good value price, extremely easy to fit together, and very durable which is reflected in a long guarantee. It’s these qualities which see it named as the UK’s number one pent shed that can be bought online today. 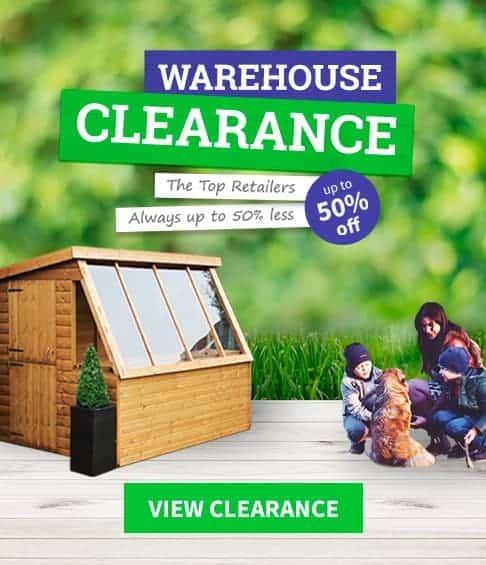 Whether you want a pent shed or apex shed, or any other variety of garden building, WhatShed bring you the in depth and unbiased reviews that can help you make a great purchase. Wooden and plastic pent sheds have their own unique benefits, but the prestigious top spot in our league table goes to a metal pent shed from Australian manufacturer Absco. Their sheds are becoming increasingly popular in the UK, and when we looked at this tough and great value shed it was easy to see why. It has a base area of 3.00 x 1.52m, and its ridge and eaves heights of 2.06 and 1.80m respectively are more than reasonable for a mid sized pent shed. It also comes with a 20 year manufacturer’s guarantee, which makes the asking price of under four hundred pounds even better value for money. If you don’t like the idea of having anything too metallic looking in your garden don’t worry, as we found the eucalyptus green colour scheme of this shed well applied and quite stylish. We also liked the easy assembly SnapTite system which is unique to metal sheds made by Absco. It means that anybody can quickly put this shed together, even if they’ve never assembled one before. Once assembled, the shed will be strong and sturdy, and in fact it has been tested to withstand winds of over 90 miles per hour. With toughness allied to value, and a long warranty period, it’s little wonder that this tops our list as the very best pent shed. A metal pent shed has a significant advantage when compared with traditional timber sheds in that it is virtually maintenance free. They don’t require the addition of preservative treatment, and won’t rot, fade, or be prone to insect attacks. 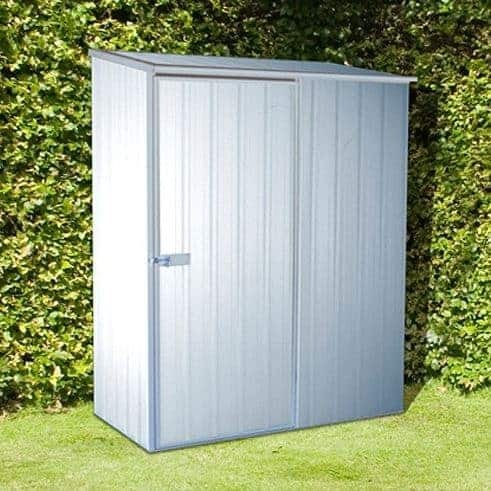 They are also often better value for money than wooden sheds, which is why this silver coloured shed from Yardmaster takes second place within our league table. 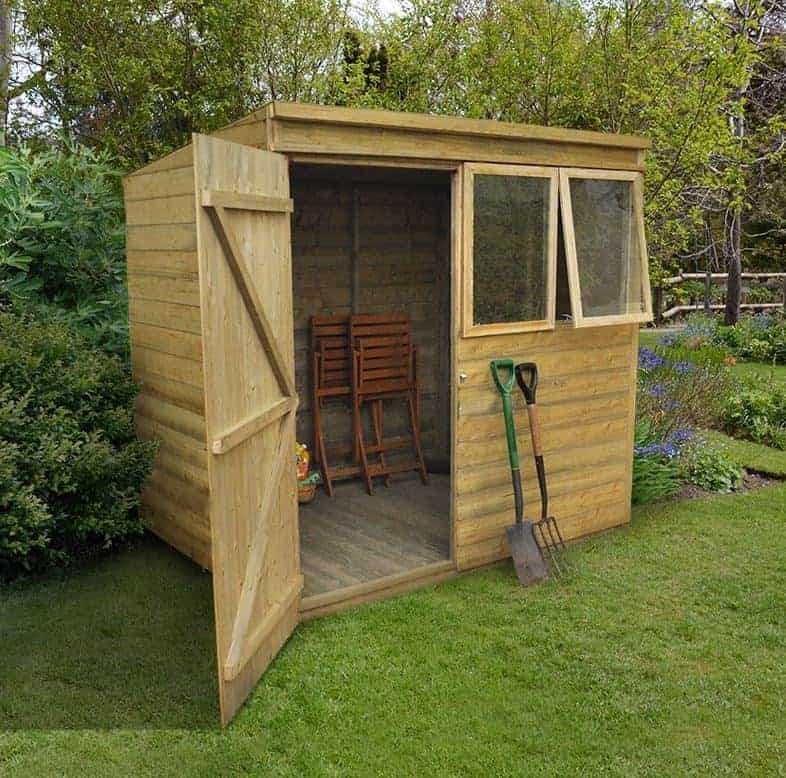 It’s not the largest shed we’ve reviewed, with a base area of 1.98 x 1.19m, but that’s still more than enough room to store a typical lawn mower and a selection of gardening tools. It’s also excellent value for money at a price significantly less than two hundred pounds. What impressed us most however, especially at this low price, was the inclusion of a floor support kit. Most metal pent sheds we review have to have a level area of concrete on which to site them, but this model allows a wooden floor to be installed on metal supports. Because the floor is then elevated above the surface it will be protected from the threat of rot caused by ground moisture. With a 10 year warranty against rust perforations adding yet more value, this makes a great purchase for those who want a low cost yet high performance pent shed. This is the first timber garden building to make it into our league table of the twenty best pent sheds, and its position within the top three shows just what a high quality and durable shed it is. This is a shed that will appeal to those who like the classic look of traditional garden buildings, and it certainly caught our attention at first glance thanks to the smooth finish and the use of high quality tongue and groove cladding. We also liked the inclusion of two opening windows alongside the single hinged door, as these not only make the interior very bright but very airy as well, which is something we often miss when we look at a metal pent shed. 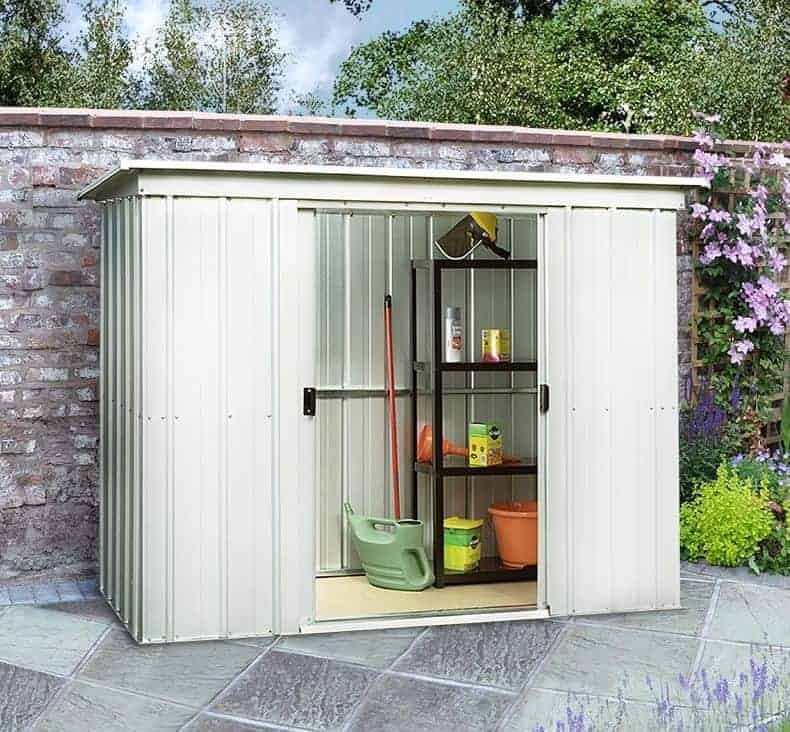 This is a shed that’s been built to be tough and durable, as exemplified by the use of a thicker than usual 45 x 28mm frame. 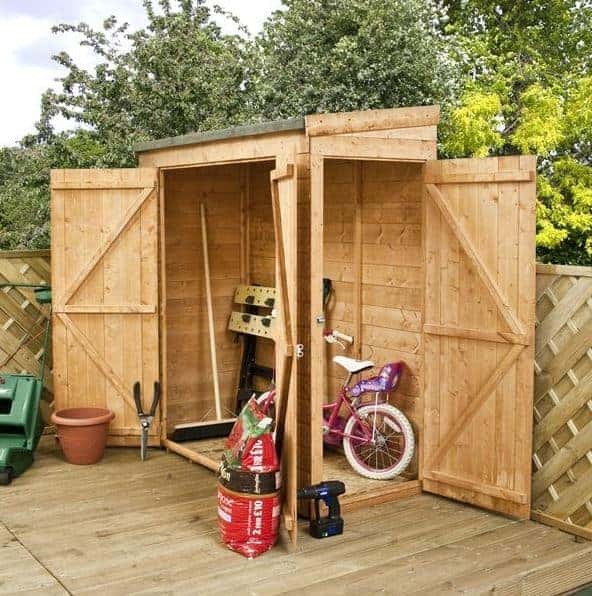 This makes this shed a good choice for gardens that are open to the elements and often exposed to high winds. What impressed us most about this seven foot by five foot shed, however, is that all of the timbers have been pressure treated. 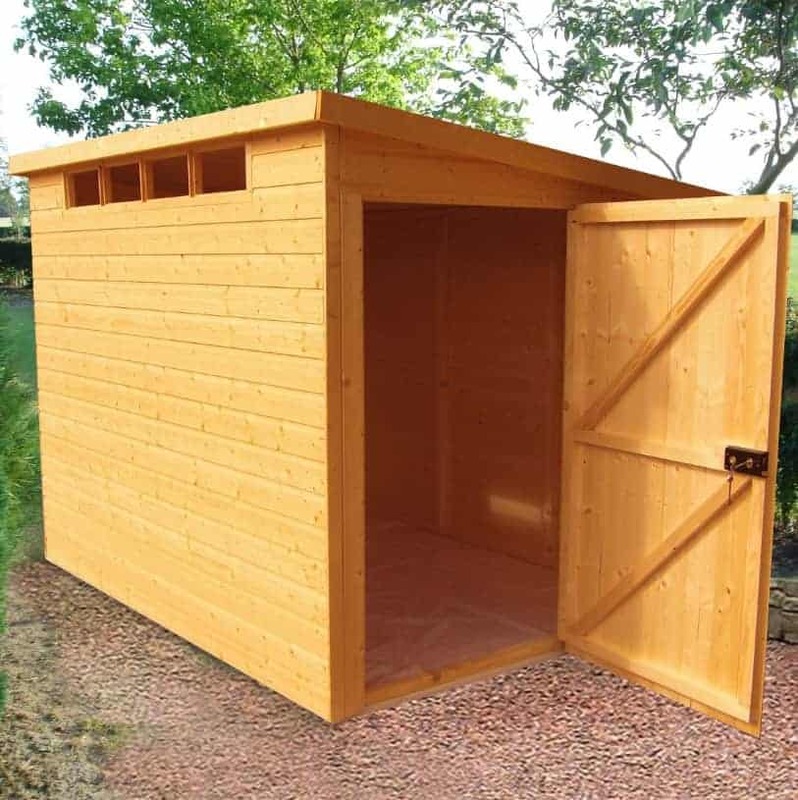 The long lasting effectiveness of this is shown by the provision of a 15 year manufacturer’s warranty, which is as long as we see on any wooden pent shed we’ve reviewed. A pent shed typically has a lower profile than an apex shed, and yet the pitch on the roof still performs the vital function of carrying rainwater or snow away. 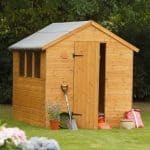 This particular shed, however, is the lowest of any six foot by four foot shed we’ve reviewed, but it’s this that gives it a unique advantage, and as it also ensures that it also comes with a very low asking price it’s this that carries it into the top five of our pent shed league table. The lower roof makes this stand out from any other metal pent shed we’ve reviewed, giving it a peak height of 1.42m and an eaves height of 1.22m. This means, of course, that it’s not suitable for spending prolonged periods of time within, but it also creates a potentially much more secure storage environment. It’s easy to hide this behind even a modest wall or fence, so that passers by won’t even know that the garden contains a storage shed. We also found this both eye catching and attractive, thanks to its compact design and the green and white colour scheme that we were pleased to find has been applied inside and out. With a long 20 year warranty as well, this small pent shed is big on durability and performance. Most of the pent sheds we review tend to be made of either wood or metal, and this is the highest placed of only two plastic pent sheds to make it into our top twenty league table. We know that many people don’t like anything that looks too overtly plastic taking centre stage in their garden, but this belies its vinyl origins with an attractive light brown colour scheme that’s been enhanced with a woodgrain effect. The pent roof itself has been given a shingled effect which also caught the eye from the moment we saw it. We found it very striking to look at, and it’s one of the reasons that it gains such a high position. 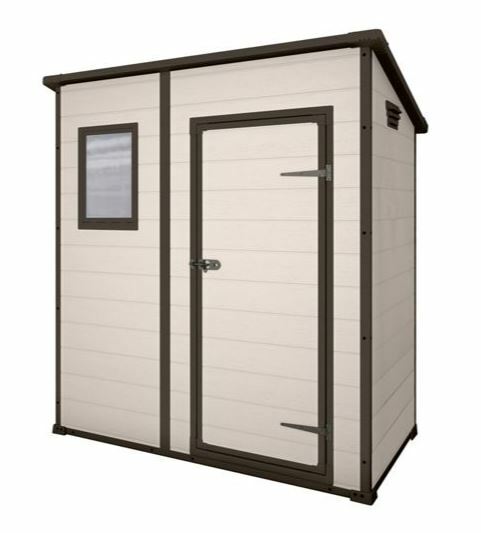 Another reason that we rank this among the five best pent sheds that can be bought online in the UK today is that it’s very strong. That’s because it has a galvanised steel frame which has then been clad with vinyl. It’s a tough and weather resistant combination, as shown by the 15 year warranty provided with it. It has a lean to style design, so extra protection from the elements can be given by placing it against a house wall, but we were pleased to find that it was more than strong and stable enough to be free standing in a garden. Just because a pent shed is typically a little shorter than an apex shed doesn’t mean that they can’t be equally as tough, as this heavy duty example from Shed Republic shows. We were pleased to find that 12mm thick tongue and groove cladding has been used throughout, rather than using cheaper solid sheet material for the roof and flooring as we often see on small to mid sized wooden sheds. This creates a stable and rigid shed once assembly is completed, especially as the framing is significantly thicker than average at 34 x 34mm. All of the timber has been pressure treated, which not only brings with it a 15 year guarantee against rot, it also means that the customer can save time and money that would otherwise be spent adding annual preservative treatments. Toughness isn’t only confined to the timber, as we were very impressed with the use of toughened glass, which is virtually shatter proof, in the window, and the addition of a secure key operated lock in the single hinged door. We rarely see these features in a pent shed of a similar size, and despite a higher than average price tag they help this strong shed gain a deserved position in the upper half of our league table. 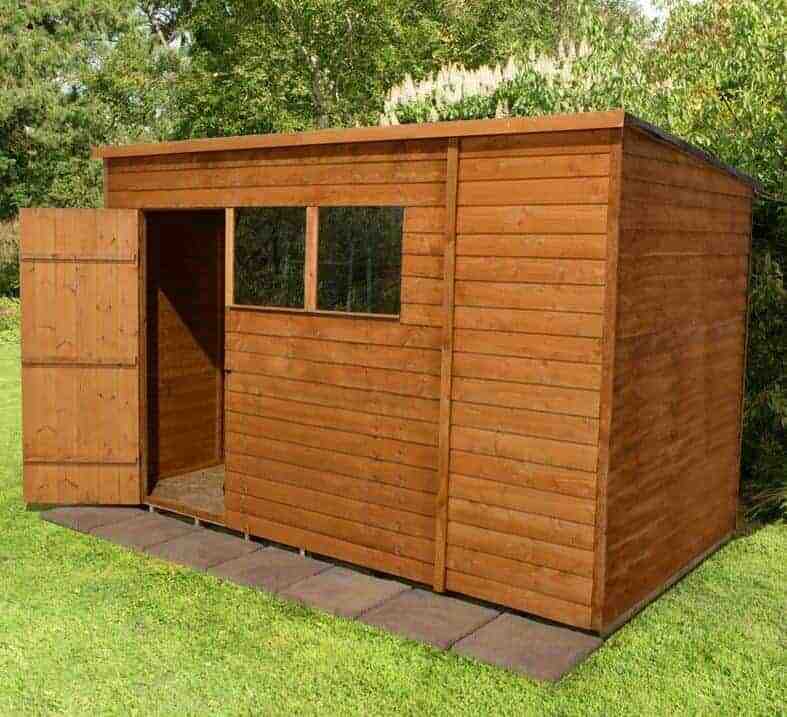 This is neither one of the larger nor one of the more stylish examples of a pent shed in our league table, but it is very tough and practical and represents excellent value for money, which is why it gains a place in the top half of our league table. The starkly silver look, or titanium as the manufacturer terms it, won’t be to everyone’s taste, and yet it has a very contemporary look about it which will fit in well with properties that have a minimalist decor. 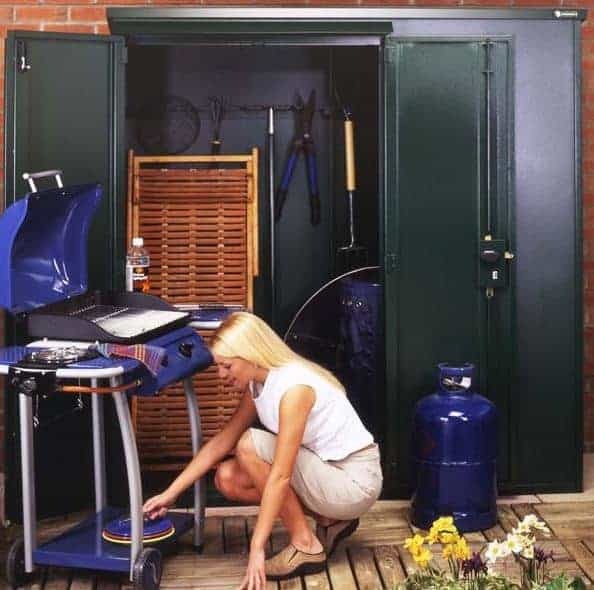 Its compact footprint means that it’s a smart choice for small gardens where every foot of lawn space is precious, but the single door is relatively high and wide so you can fit more inside than you might at first think. In fact, the eaves height of 1.80m is taller than we’d usually expect to find in a pent shed with such a small base area. Being made by Absco it benefits from the SnapTite system that we really like. Panels snap simply into place along a frame and once completed it will feel very strong and solid. There’s a 20 year manufacturer’s warranty included as well, which we feel is more than generous for a pent shed that’s priced as low as this one. This is the second plastic pent shed to earn a place in our WhatShed league table, and it’s not just the pent roof that makes this different to just about any plastic shed that we’ve reviewed. This is one of the most unique, and in our opinion, stylish sheds that we’ve seen, although it may not be to the taste of those whose preference is for traditional wooden garden buildings. The stark white colour scheme is broken up by dark grey detailing around the roof, door, and frame and it’s sure to grab the attention of friends and neighbours. One other thing that makes this unique for a plastic pent shed is the one rectangular window to the side of the single hinged door. It means that on a sunny day the interior is filled with light, making it a lot easier to store and retrieve things. We were also glad to see the inclusion of a ventilation panel as this helps to prevent the build up of condensation that plastic sheds can otherwise be prone to. The plastic itself is tough polypropylene, so whilst being lightweight it’s also strong, stable and reliable. We wouldn’t be surprised to see this good value little shed last for much longer than its 10 year warranty period suggests. 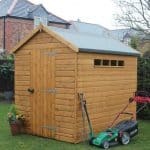 We’ve reviewed lots of garden buildings from Shed-Plus, and so we were pleased to see that this eight foot by six foot pent shed lived up to their high standards of providing high quality components at a good value for money price. This is very much a mid sized garden shed, and as the pitch of the pent roof is less pronounced than we sometimes see there’s more head room than we often see in pent sheds with a similar footprint. The ridge height is 2.08m and the eaves height is 1.91m, making this a shed that customers could walk around in, and spend some time inside, without feeling claustrophobic. On this occasion feather edge overlap cladding has been used. Whilst we always prefer to see tongue and groove or shiplap cladding used on a timber pent shed, this still felt stable and strong once it had been installed. This also helps to create a very low price, for the storage capacity, of just over two hundred and fifty pounds. With two shatter resistant windows and a 10 year warranty against rot adding extra value as well, this is a good choice for those who want a good looking and well sized pent shed but are operating on a tight budget. This is another eight foot by six foot pent shed from Shed-Plus, but it’s very different in terms of looks, strength and versatility. We’re back to high quality tongue and groove cladding across all surfaces, and as it’s backed up by thick heavy duty cladding you’ll have nothing to worry about even if you live in a windy and exposed area. We were very pleased to see that all of the timber had been given an initial pressure treatment as well. The effectiveness of this tanalisation, where preservative is forced deep into the heart of the wood, is shown by the inclusion of a 10 year warranty. What we liked most about this pent shed, is that it’s really two garden buildings in one. The shed itself takes up the main proportion, and it has a single hinged door, which we were pleased to see included a security enhancing rimlock as standard, and a well sized square window with toughened glass. Next to it is a log store, with the front open to the elements to give the ventilation that logs need if they’re to be burned as fuel. 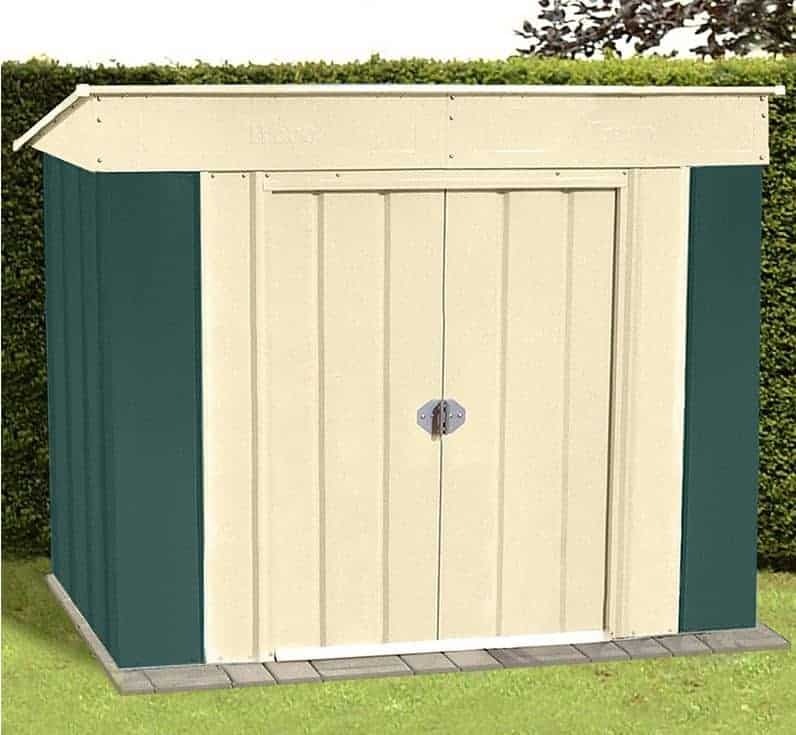 This is one of our favourite pent sheds in terms of both appearance and performance, and it’s only the high price tag that stops it appearing in the upper reaches of our league table. One of the inherent advantages that a pent shed has is that as it’s less obtrusive it can also be more secure. Even so, security is a very important consideration if you plan on storing anything valuable inside. That’s where this Titan 940 pent shed from Trimetals scores so highly, as it’s very secure and very tough. The first security measure is one that is shares with many other metal sheds, in that as it has no windows there is no way for a passer by to see what’s being stored inside, but it has many other tricks up its sleeve as well. Firstly it’s much thicker and stronger than most other metal sheds we see of a similar size, and indeed the manufacturer claims that the cladding is 50% thicker than that found in comparable sheds. We also liked the key operated locking system; just the sight of it can be enough to make some opportune thieves turn away. 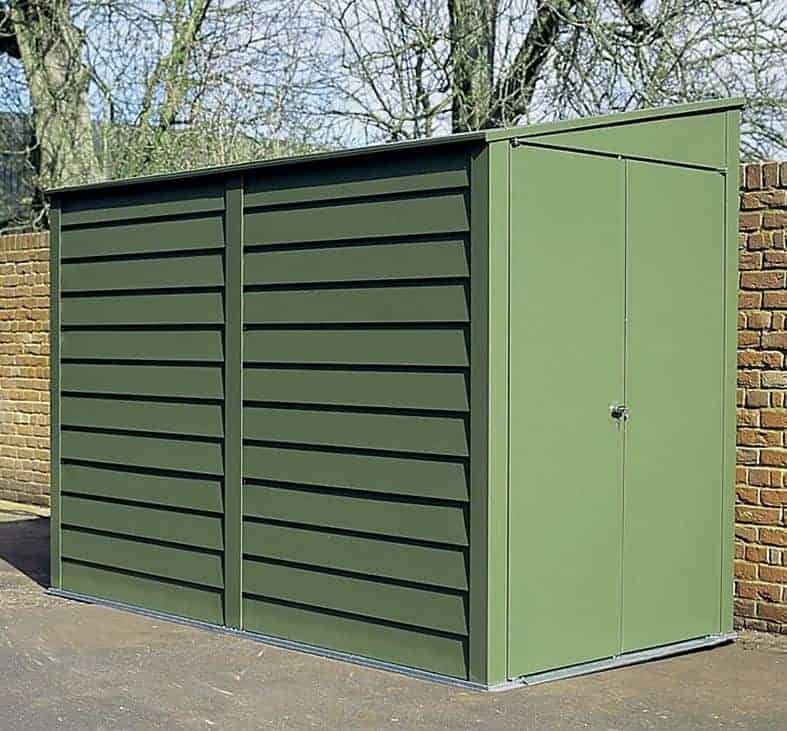 As the galvanised steel core has a green PVC cladding it blends in well against a garden background, and it’s also fire resistant to classes 0 and 1. It also comes with a 25 year warranty, which is longer than any other that we’ve seen supplied with a pent shed, and it’s only the relatively high asking price which stops it climbing much further up our rankings. The overlap cladding on this large pent shed isn’t as thick as we see on tongue and groove sheds, but it still ensures that rain water is carried swiftly away, and with so much of it on show it does create a very traditional and rustic look that we can imagine many people finding very attractive. As the timber has been dip treated as well, it comes with a 10 year warranty against rot, although this is dependent upon the customer keeping up the annual retreatment schedule. This is the one of the largest pent sheds to feature in our top twenty league table and yet it’s also one of the cheapest; the excellent value for money created by this combination earns this pent shed a place among the very best. The base area of 3.04 x 1.78m makes this a very versatile building as well, as it can be used for much more than just storage purposes. We can easily imagine this being used as a workshop for a hobby or a small scale business, and the two windows adjacent to the single door provide enough light to make it a comfortable environment to work in, or simply to relax in after a hard day at work or in the garden. Security is one of the most important factors to consider when buying a pent shed, especially if you plan on keeping valuable tools or equipment inside. One solution is to have a window free shed that ensures the contents remain hidden away, but that means that you’ll need to install an artificial source of lighting if you plan on working in the shed. That’s why we like the alternative solution offered by this generously sized and good looking pent shed. It has four windows that allow an adequate supply of natural light to reach the interior on a sunny day, and yet because these windows are tiny and positioned high under the eaves it is still impossible for passers by to see inside. Another thing we appreciated about this shed was its sheer scale, with a base area of 2.99 x 1.79m and a taller than average peak height of 2.13. That means there’s lots of room to move around in, and lots of secure storage space. Making the storage even more secure is the inclusion of a key operated lock, which we always like to see included with a wooden pent shed. 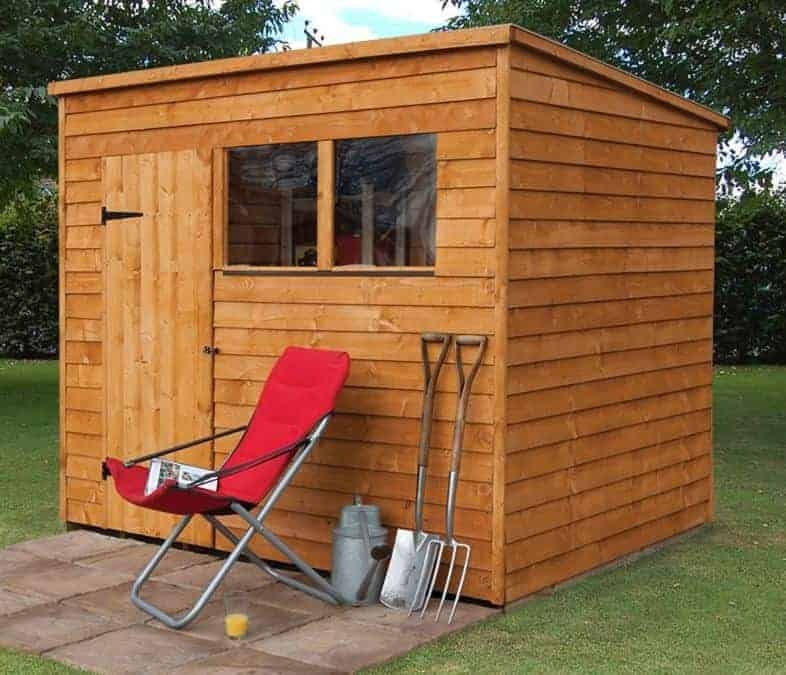 The only thing preventing this shed from being placed in the top half of our league table is its lack of pressure treatment and a relatively high price, but it still has a lot to recommend it. The tongue and groove cladding is very high quality, and locks tightly together to keep rainwater out. What we liked most about this pent shed, however, is the inclusion of four opening windows, alongside the glazed panels that are also included on the doors. They’re designed in a Georgian style which adds to the aesthetic appeal of the shed as a whole, and they mean that the interior is both light and refreshingly airy on a hot day. We were pleased to find a 10 year manufacturer’s warranty provided as well, but the lack of any flooring and a significantly higher than average price tag ensures that this pent shed remains in the bottom half of our league table. A floor can, and should, be added but this increases the purchase price. 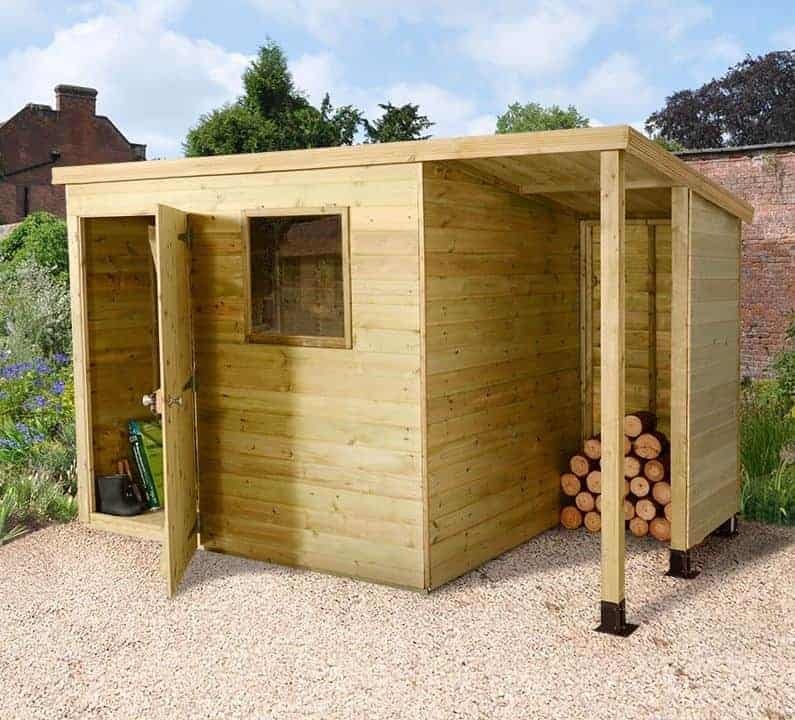 From two of the largest pent sheds we’ve reviewed, discounting log cabins and workshops, we come to a more compact model that’s ideally sized for a small garden where space is limited. It has a base area of 1.83 x 1.22m and a height at the front of 1.95m. The height of the single door is 1.78m, or five foot eight, so you may need to bend down a little when walking in and out. It shouldn’t feel too cramped when inside, however, and there’s enough room for a lawnmower with enough capacity left for shelving and garden tools. We found the shiplap cladding on this shed to be very well cut, and very attractive as well. Being tightly interlocking it ensures that there are no gaps for rain to find a way through, and of course the pitch of the roof also carries precipitation away rather than allowing it to settle. 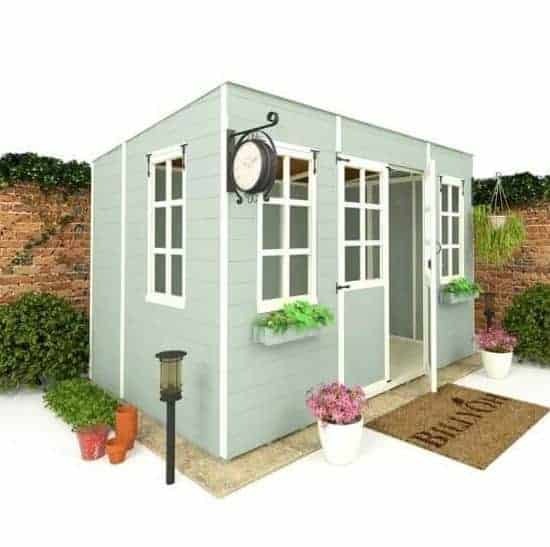 For such a good looking and well built shed we feel this represents very good value for money, with a price tag of less than three hundred pounds. 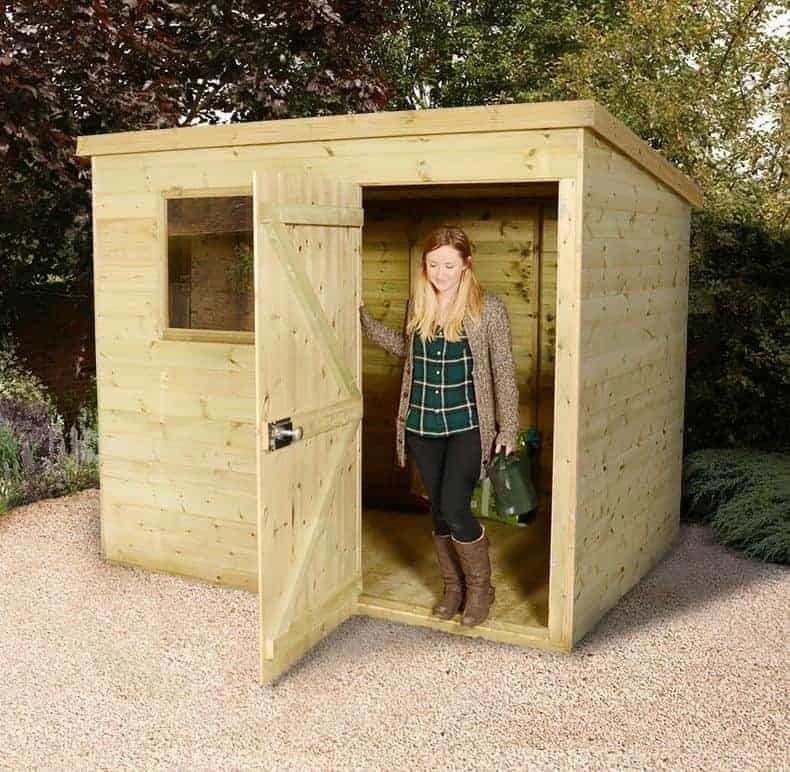 With the added value and added peace of mind of a 10 year warranty as well, it’s this that carries this classically styled pent shed into our top twenty league table. This is the second smallest pent shed in our league table, with a low asking price as well, and yet its clever and unique design means that you can store a lot more inside than is at first apparent. On first sight this appeared to be a relatively standard wooden pent shed, although we instantly noted the smooth and high quality tongue and groove cladding. It was then, however, that we noticed that it has two sets of doors: a double door at the front, and a single door at the side. 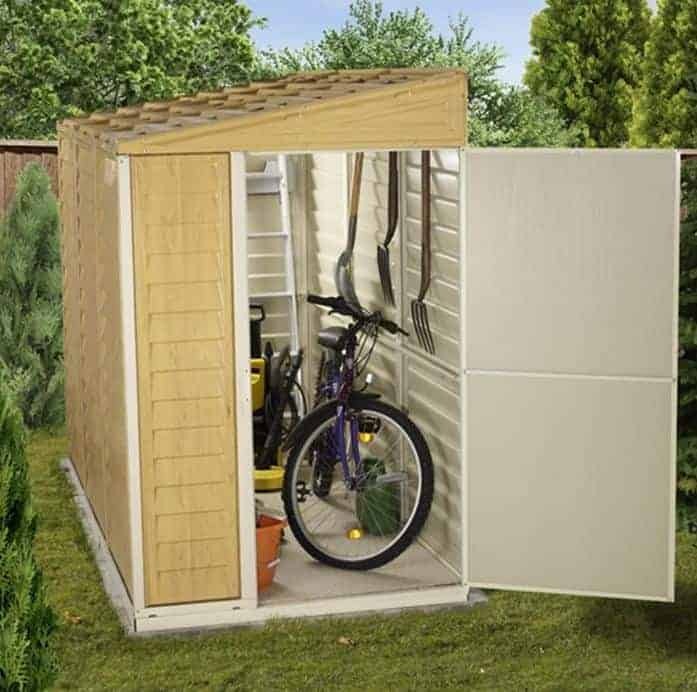 When all are opened it makes the act of moving items in and out easier than we’ve seen on any other wooden shed we’ve reviewed, and this makes it an especially good choice for storing bulky or oddly shaped items. It would also make a convenient all weather storage facility for bicycles. Whilst the floor is solid board material, which we often find with smaller and less expensive wooden sheds, it’s thickness of 10mm is a little greater than we often find. Another advantage that this smart little pent shed brings to the consumer is that it has a modular design. In effect it’s a semi-prefab shed, meaning that you won’t have to spend too long joining parts together, and the assembly is quick and straight forward. 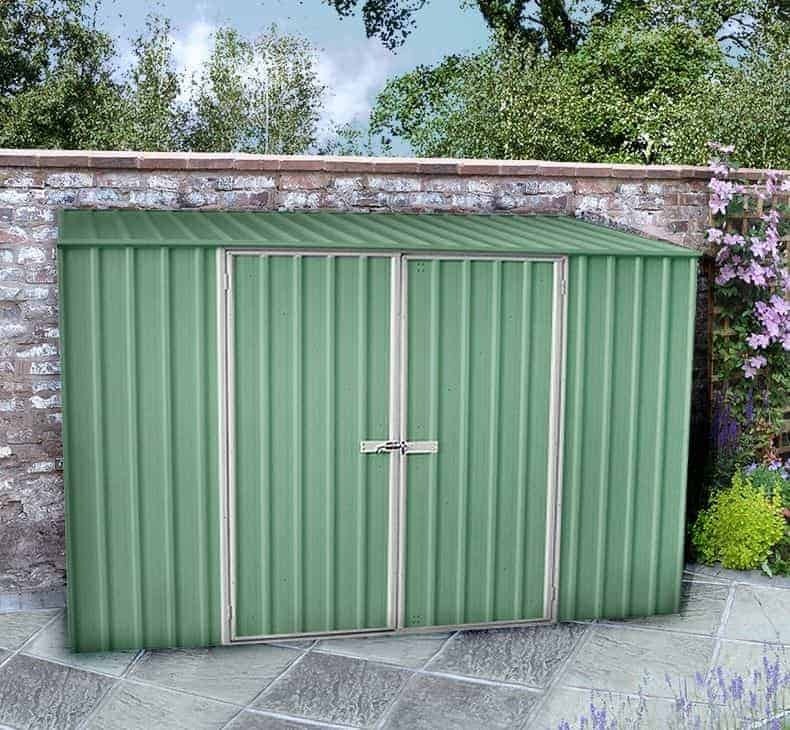 When you think of a metal pent shed the first word that comes to mind is ‘toughness’ and that’s certainly a key feature of this Asgard shed, and one that helps it gain a place among the 20 best pent sheds that can be bought online in the UK today. It’s been designed with security in mind, and one feature that we particularly liked which exemplifies this is the inclusion of a key operated five point locking system. This is much more secure than the locks we’re used to seeing on the garden sheds we review, and it’s designed to be drill and pick resistant. Put simply, when you turn the key on this shed you won’t have to worry at all about whatever’s kept inside. So tough and effective is this pent shed that it’s LPCB approved. This is the Loss Prevention Certification Board, who certify that the shed meets high standards of security. That’s not all this shed has to offer, however. Whilst it’s designed for function rather than form, we found the dark green colour scheme applied to the galvanised steel cladding to be pleasing on the eye, and whilst it carries a 10 year guarantee we would expect it to last even longer. 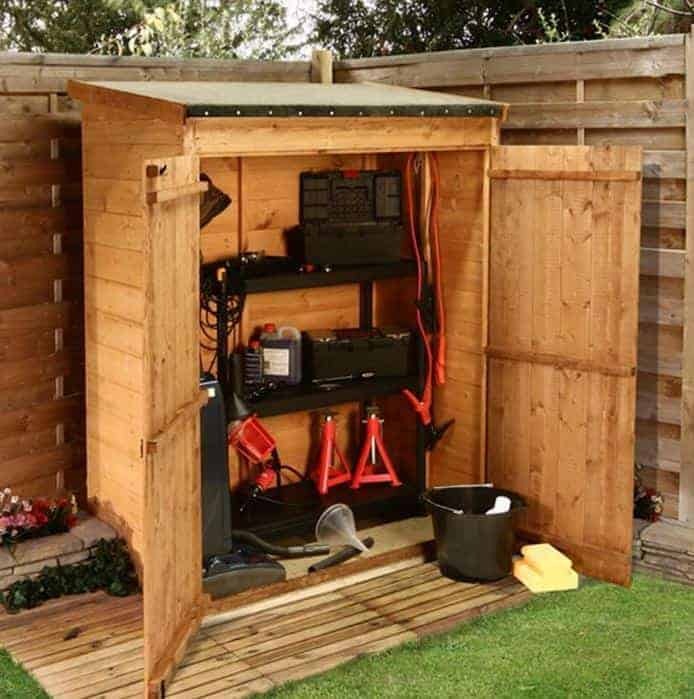 It’s only the high price tag for a compact shed that stops this being placed much higher, but if security is your main concern then add this to your shortlist. This is the smallest pent shed in our WhatShed league table, with a width of 1.28m, a depth of 0.81m and a height of 1.69m, and it’s also the least expensive. That makes it an ideal choice for those who want a small scale storage facility that will make their gardening easier and more convenient. What we liked most about it, and what elevates it above most other small pent sheds that we’ve reviewed, is that there hasn’t been any compromise made on the quality of components used. High quality tongue and groove cladding has been used for the walls, and there’s even a five year warranty which we wouldn’t necessarily expect at this price. When we review wooden sheds from the BillyOh range we’re used to seeing them supplied floorless, with a floor having to be added as an optional extra. We were pleased, therefore, to find that with this their smallest shed a solid board floor is included as standard. We also liked the wide opening double doors, so moving items in and out is easy. 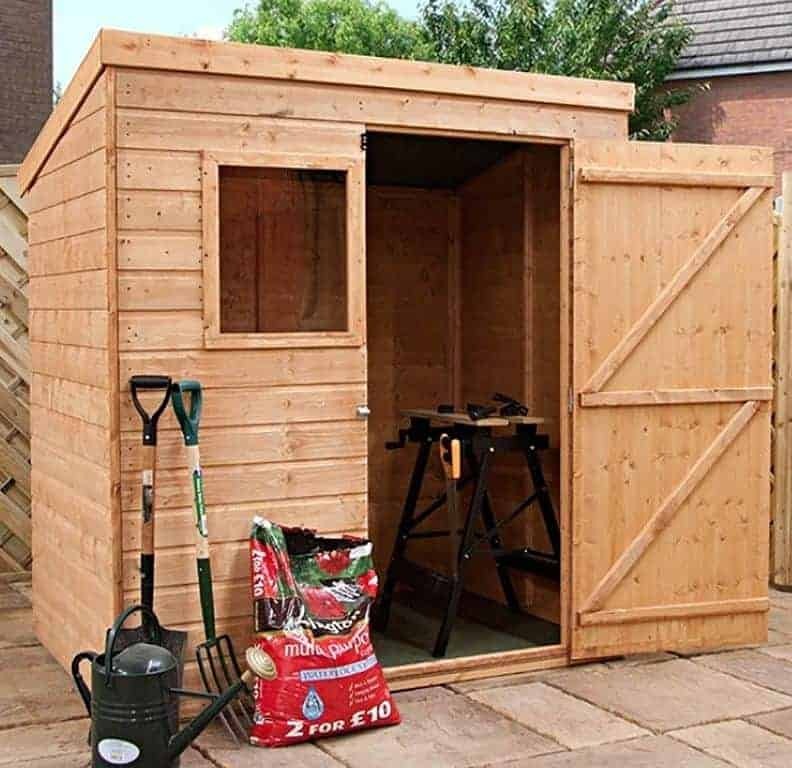 If you don’t need a lot of storage space, but want a good looking and well built pent shed that costs less than two hundred pounds, then this could be exactly what you’re looking for. 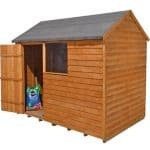 Strongman, as the name suggests, are renowned for making a range of tough garden sheds in both apex and pent varieties. This mid sized model, we feel, has ideal dimensions for the average garden, with a width and depth of 2.35m allied to a peak height of 2.01m and a six foot eaves. This means that there’s a large amount of storage space available and enough room to sit down in the shed and pursue a hobby, and yet it won’t take up too much precious lawn space from the garden itself. There are four windows along a side panel, so the profusion of light makes this one of the better pent sheds we’ve seen for working or relaxing in. We were also impressed by how strong and stable this pent shed is, although it’s something we’ve come to expect from this manufacturer. The 12mm tongue and groove cladding used throughout is very much standard, but the heavy duty framing of 44 x 27mm makes it ready to stand up to anything the British weather can throw at it. We also liked the inclusion of a key operated locking system, making this shed not only strong but also secure. What we didn’t like as much was the lack of any preservative treatment or extended warranty, and this accounts for its penultimate position within our league table. This may not be the toughest or most contemporary wooden pent shed that we’ve reviewed, but it has a traditional and rustic look that we know many people will find very appealing. That’s because it is the only shed in our top twenty league table that has waney edge cladding, where the timbers are applied in their natural cut state giving an irregular and yet attractive styling. On a larger shed this could have resulted in a relatively flimsy structure, but we are confident that at this seven foot by five foot size it will still feel solid and stable when assembled. There is no flooring included as standard, which is not surprising with a BillyOh wooden shed, and so to add one will put at least an extra £37 onto the asking price, but we still feel that this pent shed is good overall value for money for those looking for a low cost garden storage option with a traditional wooden look. We also liked the inclusion of two fixed windows, and being made of styrene they are shatter resistant and therefore safe for areas where children will be playing. 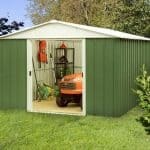 We would, however, have liked to see an extended warranty provided and the lack of this keeps this budget priced shed at the foot of our WhatShed league table. I am looking for a basic, pent roof shed 8ft x 6ft with a single window on left side of the left side hung door on the 6ft end , with the roof fall to the right . Hi Keith, you could always contact a local retailer and see if they can do a custom build for you. What you are asking for should be an easy job for them.